Recently I was given a review copy of a upcoming WSO that promises to to teach you how to ‘make money online playing games’. Before I dive into the WSO let me give you some background information. 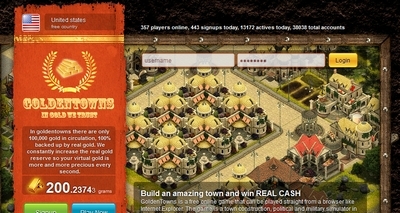 If you have not yet heard of it, there is an online game called “Golden Towns” that has game play sort of like “Sim City” in that you build a town and earn income etc. The difference between this game and others though is that the virtual currency you earn in the game is backed by real gold. The virtual currency can then be ‘cashed out’. That is exchanged for the dollar value of the gold that you earn. This WSO is based around the idea of playing this game and earning virtual currency, which as I said is backed by real physical gold, so that you can cash out and earn money. While the guide itself is well written and very detailed explaining how to play the game in depth and giving solid methods for earning the in game currency there are some real problems with the WSO as a concept. 1) There are only 200 grams of gold in backing the entire game: This is a huge one, gold is worth about $40 per gram so this means that the total value of all the in game currency is only $8000. Who in the right mind would take time to invest in a income strategy that has a max potential of only $8000? No one would. 2) The site itself looks dodgy: The website itself looks quite poor and low tech. I have also noticed that some of the pages on the site dont work and some of its functionality is broken. This takes away from the sites credibility and thus the confidence that you will actually get your promised payout. Given this and the fact that its backed by such a low amount of hard currency and I have no faith at all in the site or its promises. Overall I would say this this WSO is a complete waste of time. In fact the only value I got from it is that I was able to write an article about it. While it is well written and detailed its an example of a poor quality IM product simply because its based around a unsound concept. My advise. Save your money and dont buy it. I am now not sure where you’re getting your information, but good topic. I must spend a while learning more or working out more. Thank you for great information I was searching for this info for my mission.